A couple of weeks ago I was invited to a Soiree at one of the hottest little shops here in Philly called Pinot Boutique. 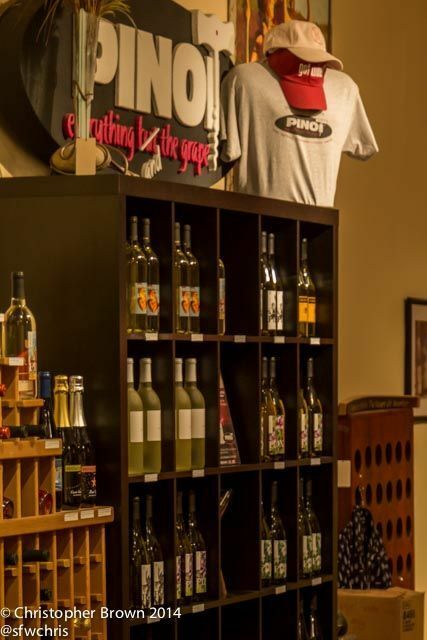 If you’re a wine lover and love all things wine, this little shop has everything from wine tasting to attire. It’s a one stop shop. The owner of Pinot Boutique, Dan aka Dan the wine man, is super friendly and inviting whether its your first time doing a wine tasting or if you want to discuss wines from around the world. Pinot Boutique also offers classes and during the super they have a wine cruise which is such a good time. Something that I love the pinot has is the paint can filled with wine for purchase produced by Paradocx Vineyards. It’s about 4 bottles of wine in a can. I think that is a perfect gift or great for parties. After a day of cruising in old city, Pinot Boutique would be a great way to end a beautiful fall afternoon. Pinot Boutique has been open since 2006. Dan was inspired after a trip to California to bring something fun back to Philadelphia. We all know how great some of the California wines can be. Dan just didn’t want a wine tasting store he wanted people to be to come to a one stop shop. The only thing you cant purchase are the grapes. Below you will find a couple of videos on Pinot Botique. We really wanted to go, but had to back out at the last minute. We’ll have to drop in when we are in town. Wish I’d known about this place on my most recent Philly trip this past summer. I’ll have to make a stop there on my next visit.